Enjoy a free breakfast and free Wi-Fi access at the non-smoking Super 8 San Diego Area/La Mesa where all rooms have large flat-panel TVs. The two-story hotel has 30 with free Wi-Fi and flat-panel cable TVs featuring HBO. You won't have to go without snacks or cool drinks thanks to the mini-fridge and microwave in every room. Start your day with a cup of coffee from your in-room coffeemaker before heading to the free continental breakfast. 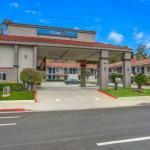 The hotel is a mile-and-a-half from I-8 and a five-minute drive from San Diego State University. A cluster of restaurants are near the hotel and shopping can be found at Grossmont Shopping Center three miles away. The hotel is on a public transportation route but if you're driving it's eight miles to major San Diego attractions like Balboa Park the Maritime Museum and Seaport Village. San Diego International Airport is 10 miles away.